Changing our eating behaviour is one of the critical lifestyle changes necessary to successfully lose weight and keep it off. For many people, changing old eating habits is one of the hardest things they’ll ever do, as anybody who has failed at dieting can attest. If you’ve tried to change your eating habits before and have failed, or if you’re about to embark on a weight loss plan that involves a change towards healthier eating, the tips in this article may help you succeed. One of the reasons most people fail to stick to a diet is that they take the wrong first step. Ideally, in order to maximize weight loss over the LONG TERM we need to change both. But it’s not a good idea to change both at once. This is where most people make mistakes. They try to change both at once or if they only change one, they change the wrong one first. When faced with the above two options, most people take option 1 first when the best first option to take to help you lose weight is typically option 2. Why? The reason is actually quite simple. It is far easier for most of us to go from eating 3 to 2 pieces of fried chicken for dinner than it is to go from 3 pieces of fried chicken to a garden salad. Sure, eating the salad will help us lose more weight than forgoing only one piece of fried chicken, but permanent weight loss is a long term process and going down to 2 pieces of chicken forever is far better than eating a garden salad for dinner for 1 week and then going back to 3 pieces of chicken for the rest of our life. Remember, we are trying to make permanent lifestyle changes here and most of us won’t stick to these changes if they are too radical compared to what we are currently doing. Making small permanent changes are better than radical changes that you won’t be able to live with. Don't worry about falling back to your old behaviour for a day or two, only the long term counts. Use portion controlled packaged foods to help you (prepackaged frozen meals and single serve snack packs for example). Use smaller plates than usual to serve your meals. When eating out, buy entrée sized meals or share a full sized meal with your partner or friend. Separate a third or quarter of the food on your plate and move it to one side before you begin eating, then leave that third or quarter uneaten at the end of the meal. Eat small amounts of food every couple of hours so you’re not starving at main meal times. Drink plenty of water throughout the day – most people mistake thirst for hunger. Eat slowly and concentrate on your meal – don’t watch TV while you’re eating for example. Gradually reduce your serving sizes over time until they reach the ideal size. When eating take away, don’t buy super-sized options. Remember that to make these changes habit you are going to have to continue to practice them consciously for awhile (maybe up to 3 months) until they become unconscious. Be the last one at the table to start eating. Put your fork or food down between bites. Chew or swallow each bite before the next. Pause in the middle of the meal. Don’t eat while cooking – this increases your total serving size, often without being noticed. Place leftover food in small, single serve containers. Have soup or a salad with low calorie dressing to begin a meal. As soon as you begin to feel full, stop eating. Try to reduce stress in your life and other things that cause you to eat on emotion. OK, you’ve gradually started to reduce the amount of food you eat and are starting to slowly (but surely) lose weight. If you haven’t already, now is the time to start to become more active to improve your general level of fitness, increase your energy levels and of course speed up the weight loss process. Now that these habits are well established, it’s time to start thinking about making minor positive adjustments to what we eat. Instead of eating a piece of fried chicken for dinner for example (we’ve migrated from 3 down to 2 and now down to 1) maybe we can have a piece of fried chicken without the skin or a piece of grilled or broiled chicken instead. And maybe we can replace half of the chips that accompany our chicken with a corn cob or a handful of your favourite steamed vegetables. See how we’re making small positive changes that we can live with? While changing what we eat is often more difficult that slowly but gradually reducing how much we eat, there are things that we can do to make sure that when we do begin to change this aspect of our behaviour that we are successful. A healthy diet is a balanced diet and a balanced diet has plenty of variety - occasional fast food meals are OK; just don't make them the staple. 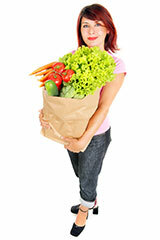 Plan ahead – don’t be forced into choosing inferior food options because you failed to think ahead. Start by modifying your breakfast. Breakfast is so important that it is the logical place to begin when trying to improve your diet. Whole-grain, high-fiber cereals with low-fat milk are an excellent choice. Understand and read the Nutrition Facts labels on packaged food. Compare the nutritional facts of like products and if possible, opt for the choice with the lowest calories, sugar, salt and/or fat. Be adventurous; try new dishes whenever you can. Remember that the cooking method you use can increase or reduce the calories contained in food. 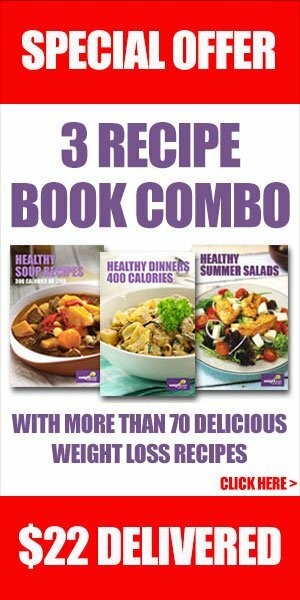 Buy a new cookbook or food magazine for food and healthier choice ideas. Exchange healthy recipes with friends. Alternate alcohol with low calorie drinks (water is perfect). Join a healthy cooking class. Start a healthy cooking dinner club. Invite friends over for a vegetarian (or other theme) meal. Make meals delicious as well as nutritious. Remove temptations from your home. Become physically, not externally connected to eating. Shop using a shopping list and never shop when hungry. Be wary at cultural and social events – don’t let your guard down. Feel proud every time you say "no" to a problem food. Neutralize food. There are no good or bad foods - all foods are OK when eaten in moderation. Set goals, track your progress, and reward yourself to stay motivated. Slow down your busy lifestyle. Understand your personal barriers to change so you can avoid excuses. Don’t look for quick fixes and easy options. Watch your language, especially when talking to yourself. Change your reward system so that it is not based on food and rewards behaviour modifications, not weight loss results. Enlist the help of qualified professionals (e.g. a registered dietitian, a physician, a personal trainer and/or a psychologists). Good luck and remember you can do whatever you set your mind to!